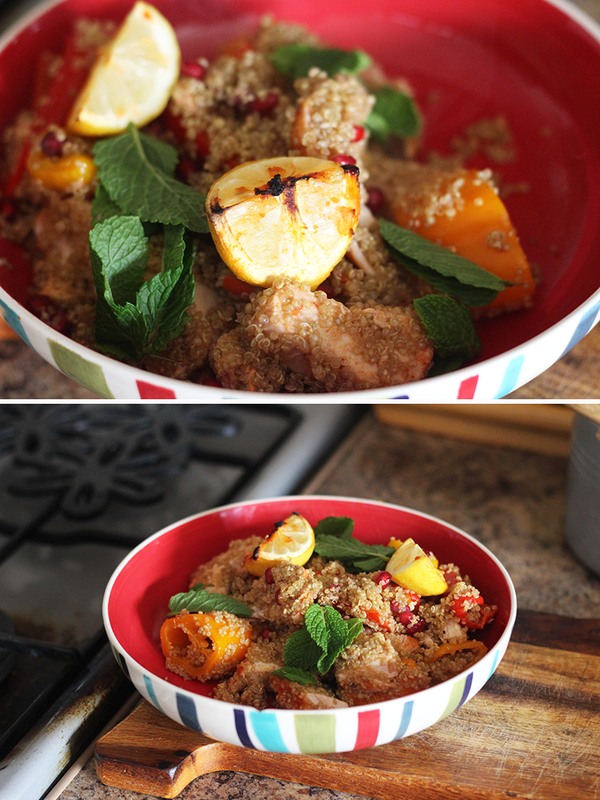 The #TryTOTAL Challenge: Harissa Roasted Chicken with Quinoa Salad. Since coming back from New York in June, my attempt at creating a healthy lifestyle kinda took a different turn (the food is SO.GOOD.OUT.THERE) and now I’m trying to get back to where I was in regards to healthy eating. It’s always hard with food though, because it gets to a point where you’re either fresh out of ideas, or have loads of healthy recipe ideas which eat away at your finances. Healthy food is muy expensive! 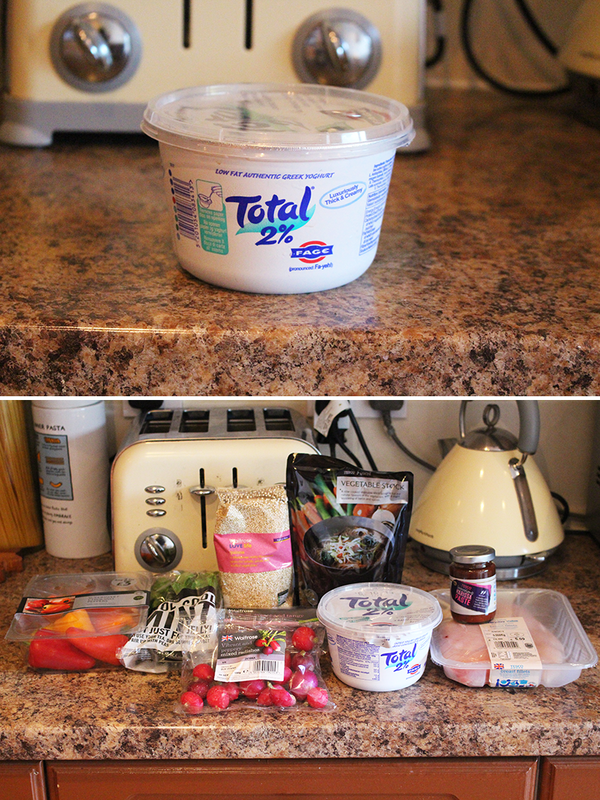 Which is why I was so thrilled when the guys over at Total Greek Yogurt invited me to try out the #TryTOTAL Challenge where the aim was to try as many different recipe combinations with their TOTAL 0% Greek yogurt in seven days. I’ve never, ever thought to use yogurt while cooking lunch and dinner recipes so I was really excited to try this out as I’m such a huge yogurt eater. I was sent some ingredients to make the chicken and quinoa* salad, which turned out lovely by the way so I thought I’d share the recipe with you guys. 1. 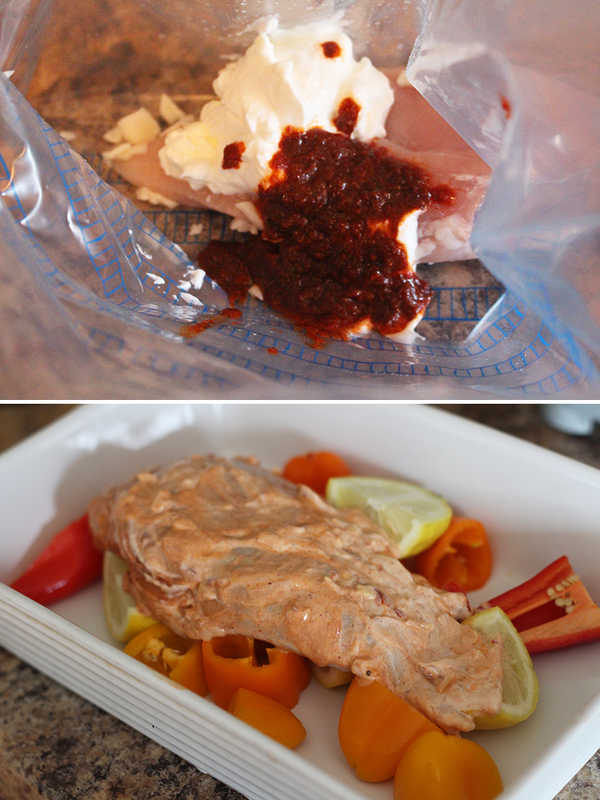 Score the chicken a few times, then put into a strong large food bag with the yoghurt, harissa paste and garlic. Seal and massage the bag to coat the chicken. Set aside for at least an hour or overnight, chilled. 2. Heat the oven to 190°C / 375°F / Gas Mark 5. Put the peppers and lemon in a 2 litre ovenproof dish. Add the chicken and bake for 30 minutes. 3. Meanwhile, bring the stock to the boil in a small pan, add quinoa and cook over a low heat, covered for about 15 minutes until the stock has been absorbed. Cool for 10 minutes. 4. Rest the chicken for 10 minutes on a board then slice thickly. Mix the peppers with the quinoa, radishes, fennel, mint and pomegranate seeds, then serve topped with the chicken and roasted lemon. When I tell you that there was a party in my mouth?! It’s amazing how much of a difference adding yogurt makes. There are so many different textures and flavours within the dish that make it exciting as well as filling. 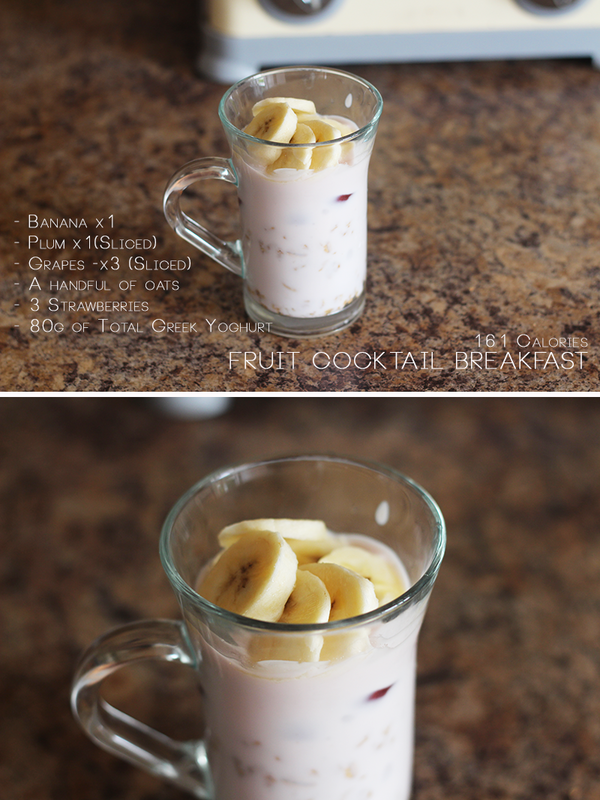 I also used what remained of the yogurt to make a Tandoori Chicken Pasta salad and a fruit cocktail breakfast (below). With this dish, I literally blended the yogurt with the strawberries, poured into the mug and added the fruit and oats and stirred. Incredibly filling and quite tasty. The versatility of TOTAL 0% Greek Yogurt means you can literally add or use it as a healthy alternative to most dishes without compromising on taste. A staple on the ole’ shopping list from now on. Check out the TOTAL website for more recipes and join the TOTAL Greek Yogurt Facebook page to have a go at the #trytotal challenge for a chance to win a years’ supply of yogurt! *Pronounced “Keen-Noir”. All this time I’ve been going around calling it “Qwin-ona.”. Such a pleb am I.